Turbulent flames with high Karlovitz numbers have deserved further attention in the most recent literature. For a fixed value of the Damköhler number (ratio between an integral mechanical time and a chemical time), the increase of the Karlovitz number (ratio between a chemical time and a micro-mixing time) by an order of magnitude implies the increase of the turbulent Reynolds number by two orders of magnitude (Bray, Symp. (Int.) Combust. 26, 1–26 1996). In the practice of real burners featuring a limited range of variation of their turbulent Reynolds number, high Karlovitz combustion actually goes with a drastic reduction of the Damköhler number. Within this context, the relation between the dilution by burnt gases and the apparition of high Karlovitz flames is discussed. Basic scaling laws are reported which suggest that the overall decrease of the burning rate due to very fast mixing can indeed be compensated by the energy brought to the reaction zone by burnt gases. To estimate the validity of these scaling laws, in particular the response of the quenching Karlovitz versus the dilution level with a vitiated stream, the micro-mixing rate is varied in a multiple-inlet canonical turbulent and reactive micro-mixing problem. A reduced n-decane/air chemical kinetics is used, which has been derived from a more detailed scheme using a combination of a directed relation graphs analysis with a Genetic Algorithm. 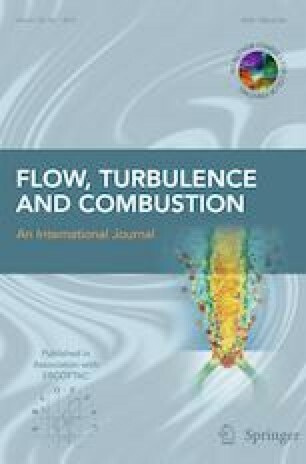 The multiple-inlet canonical micro-mixing problem includes liquid fuel injection and dilution by burnt gases, both calibrated from conditions representative of an aeronautical combustion chamber. The results confirm the possibility of reaching, with the help of a vitiated mixture, very high Karlovitz combustion before quenching occurs. The first author is supported by the European Union under the project SOPRANO, Horizon 2020 Grant Agreement No. 690724. The second author was funded by ANRT (Agence Nationale de la Recherche et de la Technology), SAFRAN-SNECMA and Air Liquide under the CIFRE No 1053/2013. Computing time has been provided by CRIANN (Centre Régional Informatique et d’Applications Numériques de Normandie).